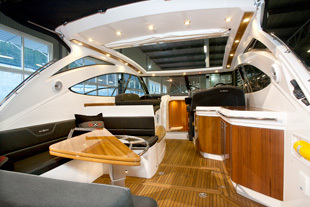 The much anticipated Nord West 430 has finally hit the water after a longer than expected gestation period. But judging from these first photographs it looks like it has been well worth the wait. Unlike many of its rivals, the 430 will be available in both open and hardtop versions, both of which look sporty and elegantly proportioned. Owners will also have the choice of three different interior layouts, including an unusual three double cabin with single heads option as well as the more usual two ensuite double layout. 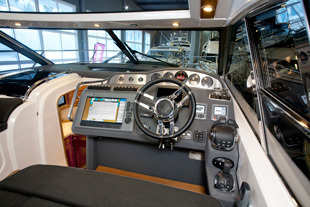 The two-level cockpit features a well-designed two-person helm area with a raised seating area opposite and a large eight-person dinette behind on a lower level built around an electric high/low table. 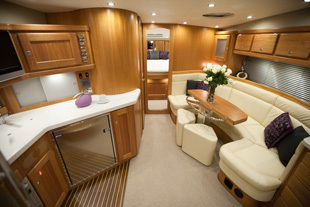 A wet-bar with griddle will keep the crew well fed and watered. The fit and finish looks to be up to Nord West’s usual high standard, while the deep-vee hull and a choice of powerful sterndrive and IPS options should ensure plenty of get up and go. If the price can be kept competitive it should provide stiff competition to the likes of Fairline’s Targa 44 and Princess’s V42.